Problems with GroovyMame, ArcadeVGA 3000, MakVision Tri-Mode 25”. Missing step? GroovyMame, ArcadeVGA 3000, MakVision Tri-Mode 25”. 1. Downloaded GroovyMame64 (.146u2) and the Calamity 1.3b drivers (for the VMaker and Arcade_OSD app) and put them into a clean MAME folder. 2. Edited vmaker .ini file to point to MAME .exe file. Set it to generate an MAME XML the first time you run. Leave the monitor type as "CUSTOM". I also tried using the specs for NANAO MS-2930/MS-2931 with no change in performance. 4. Launched Arcade_OSD to verify video modes. 5. Generated mame.ini GroovyMAME -cc. Re: Problems with GroovyMame, ArcadeVGA 3000, MakVision Tri-Mode 25”. Missing step? With an ArcadeVGA 3000, you shouldn't be running VMMaker because the modes are hard-coded and can't be changed. Running VMMMaker may have messed things up. Install ArcadeVGA 3000, install Ultimarc drivers, run groovymame. That's it. Groovymame will pick the best resolution from the available ArcadeVGA resolutions. I ran the un-installer and started clean again and did not use VM_Maker or Arcade_OSD. But, same problem. I believe it’s a problem in the monitor configuration area in MAME.INI. MakVision is the only company even making CRTs any more this should be the new standard I would think. For example, when I launch Popeye and the monitor doesn’t click (to switch resolutions) it looks fine. But when I change the monitor configuration to CUSTOM (and enter in the NANAO MS-2930/MS-2931 specs) it clicks after launch and the screen is shaky and blurry. I know Suzo Happ is the MakVision tech support here in the US and if you could tell me what I need to ask them for. Maybe I could get more accurate monitor specs? Or, does something else need to be changed? Hmm... I guess Calamity will need to advise you on this one. If your monitor is a tri-sync, did you install the Ultimarc tri-sync utility? Yes, I did install the tri-sync utility. Thanks. Do I just wait for Calamity to chime in or should I send him a message? Thanks. You don't need to use the "CUSTOM" keyword inside mame.ini, that one is for vmmaker which you're not going to use. So just leave the default there and paste the right monitor_specs lines. and attach the file here, that will show us what resolution is being used. Thanks for the prompt response Calamity. I changed MAME.INI back to the default which was CGA. Is that the correct setting for a Tri-Mode monitor? I left the monitor_specs lines with the settings for NANAO MS-2930/MS-2931. Still no change. It jitters almost like the vhold pot isn’t set right but this isn’t the case. I’ve tried adjusting it and it doesn’t fix it. Also, Street Fighter 2 CE looks perfect and I believe they are both 15khz games. It's picking the right resolution: 512x448, that should be fine for your monitor. Could you check this resolution with Arcade_OSD to see if it works? I checked the resolution with Arcade_OSD and 512x448 @ 59hz is shaky and un-usable. However, if I move to 512x384 @59hz it looks great. Any ideas? Scrolling through all the resolutions some display properly and some are shaky or blurry. Also, all the Vfreq’s are either 59hz or 60hz. Shouldn’t there be some 15hz or 30hz since it’s a Tri-Sync monitor? How do does the PIXES x PIXELS number work with the Vfreq rate? Shaky resolutions might require monitor adjustment to get a stable picture. Is your monitor connected to the VGA port on the ArcadeVGA? The DVI port is for PC monitors only. Are you sure that the Ultimarc tri-sync utility installed properly? Can you select 15KHz resolutions using the quickres (galaga) icon in the system tray? 1) Is there a way to exclude resolutions in GroovyMame? So, it uses 512x384 instead of 512x448? 2) Is it possible for a damaged monitor to display some resolutions perfectly and others not? 3) Maybe the ArcadeVGA is damaged? Would I get a better result by just buying a regular video card and using Calamity’s drivers? Arcade_OSD doesn't show the horizontal frequency because that information is not available, the OS doesn't care. However, it's easy to guess it once with some practice. 15/31 are kHz, not Hz. This is horizontal frequency. You can't exclude resolutions in GroovyMAME. GroovyMAME assumes that if you have a resolution available, it's because it works. However you can force a given game to run at a different resolution by means of an ini file. But you can't do this globally. And it's a bad solution if you ask me. I don't think the AVGA is damaged. I mean these things are not totally random. There is usually a rule for a group or resolutions that does't work. Anything below 288 lines is 15 KHz. 512 x 384 is 24 KHz, so that means that range is probably fine. 512 x 448 is either 15 or 31 KHz, depending if interlace is on. Interlace means a shaky picture, but you need to judge if the shake you're seeing is due to interlace or it's something different. The tri-sync utility however should remove interlaced resolutions and make them progressive, as far as I understand. I have adjusted all the knobs on the remote control board and the only knob that looks even close is the vhold pot but that doesn’t solve it either. Yes, it’s connected to the VGA port. Yes, the tri-sync utility is installed properly. The resolutions don’t specify if the KHz. Are 15KHz just the lower resolutions? Many of the quickres resolutions work but many don’t. For example, using quickres switching to 512x448 is shaky but 512x384 looks fine. I’m getting the same results with Arcade_OSD as I’m getting with quickres. If you're using the drivers that came on the CD with your ArcadeVGA, they might be the older drivers with the interlace problem. As for your question about using an ArcadeVGA vs a normal ATI card + Calamity's modified drivers... That's up to you. Personally, I love the ArcadeVGA and I've owned both an AGP version and the current PCIe version. If you want plug and play, it's the easiest solution available, though the number of resolutions are limited. With that said, you really should at least TRY a normal ATI card to see which you like better. Having nearly unlimited resolutions with the "magic resolution" feature is pretty awesome. My current recommendation is something in the ATI Radeon HD 4000 series if you often run modern PC games (not MAME) on your monitor and need the extra performance. If you are only running MAME and other emulators, then I recommend an ATI Radeon X600 XT. You can find them on Ebay pretty cheap. I recommend getting one with a VGA port if possible. I also lean toward fanless models because the tiny high rpm fans on those old cards were crap quality and very noisy. Thanks Calamity and Krick for the details. The problem I’m seeing is definitely interlacing. Looks exactly like Interline Twitter (http://en.wikipedia.org/wiki/Interlaced_video#Problems_caused_by_interlacing) at 512x448. Krick, I just removed the Ultimarc software, downloaded the latest Windows XP 64 drivers, and installed them. Still getting interlacing at 512 x 448. I used the Tri-Sync to work at 15hz only and also Mutli-Freq with the exact same results. Another strange thing is Ms. Pacman looks terrible. It’s running at 288x224 and looks very blurry. I went to Arcade_OSD and also the Galaga icon and there was no 288x224 resolution listed so it looks like it’s running at an un-supported resolution for some reason. Any other ideas? Is there a way to check (besides visually) if a resolution is running in progressive or interlaced mode? I’ll also order some of those ATI cards and see if I can get better results. Thanks. The updated drivers don't prevent interlacing, they just make certain interlaced resolutions easier on the eyes. In Arcade_OSD, you can either see a "p" or "i" next to the vfreq value, that stands for progressive/interlaced, but those values are only valid if the drivers/OS are reporting them properly, so I wouldn't trust them. Interlace is obvious when you see it, anyway. It might happen that the tri-sync utility is working for some higher resolutions but didn't update the 512x448 one. Have you noticed if 640x480 is progressive? Thank you for more detailed help. I'm going to experiment with different software/hardware combinations and see if I can find the root of the problem. A friend of mine is going to give me an ATI Radeon X1300 to see if I get the same results as with the Arcade VGA 3000. For just MAME games is there any advantage to purchasing a ATI Radeon X600 XT or does the X1300 give me everything I would need? The X600 XT is the most powerful model in the R300 series. The X1300 is the least powerful model in the R520 series. I only suggested the X600 XT because R300 series based cards are known to be reliable, compatible, and cheap. The X1300 (actually all X series but for the older ones X300-X600) have problems with low pixel clocks. This means that, although these cards work with Soft-15hKhz / GroovyMAME, etc. they can't do low resolutions, you need to scale them horizontally, like 320x224 -> 640x224. This has no visual effect, it looks just fine in GroovyMAME, but I just want to warn you about this. If you can, go for one of the X300-X600, or one of the HD 4xxx family ( HD 2xxx and HD 3xxx have the same problem). Some cards listed above have known problems with low dot clocks. For best results, a X300-X600 or HD 4xxx card is recommended. Older Radeons (7000, 9200, 9250, etc.) also work without problems with low dot clocks, in case they are an option. OK, so, I re-installed Windows, Calamity Drivers, Groovy Mame. Installed an ATI Radeon X600XT. I’m almost there (the Interlacing problem is gone) but am running into a problem of ghosting on some games. Basically, the pixels look stretched like they would on an LCD display. Two examples: Popeye is running at 512x448 and looks ghosty. This resolution looks fine in Arcade_OSD, very sharp. SF2 looks ghosty at 384x224. This resolution isn’t even listed in Arcade_OSD to test. I was having this problem before I started from scratch again with Ms. Pacman (288x224) and Galaga. Ms. Pacman and Galaga both look correct now. I've attached a text file for Street Fighter CE. This should bring the 224-line resolutions back and everything should work as expected. Thanks Calamity! That fixed the problem with Street Fighter 2 CE. However, I'm still getting the same problem with Popeye. What's strange is it looks great under MAME, and MAME says it's running under the same resolution (512x448). Take a look at the text here while running under GroovyMame vs Mame. Any ideas? Not sure why the same resolution would look great under MAME but poor under GroovyMame. I've also attached a popeye.txt file generated from Groovymame. Thanks Calamity. It looks like with my reload I forgot to edit the monitor specs in mame.ini so they were all just set to auto. Once I changed them to match the NANAO MS-2930/MS-2931 specs I didn't need to change the 448 to 400 and it looked good. Everything is now almost perfect!! The last issue I'm dealing with is with Horizontal games like Pacman and Galaga. They look correct now pixel wise but cut about 2 inches off the screen on the top and bottom unless I adjust verticle size on the montior's remote control board drastically. But, the problem is once I do that the verticle games drastically shrink. Certian resolutions require different settings on the pot controls (size and position). Is there a way to fix this or do you just shoot for the best average? What you need to do is make vertical games fit and then live with the "letterboxing" on horizontal games. For most games, the letterboxing is barely noticeable once you're playing. You should be able to find settings that work for most games so you don't have to fiddle with it. The other option is to wire up a remote pot so you can easily tweak the height when switching to/from vertical games. I know some people do this, but I think it's a lot of work for something that isn't really that noticeable unless someone points it out. Another thought would be to wire up a resistor of some sort in parallel with the pot with a switch so that you could toggle between two settings for vertical and horizontal games. The trick would be finding the correct resistor value. Again, too much work, in my opinion. Are there any specific horizontal games that you think look particularly bad once you adjust your monitor for Pac-Man? Thanks for the suggestions Krick! The horizontal games don't look bad they are just too small for my tastes. I would rather set the games for horizontal (since that's the majority of my games) and then have the vertical games letter box. Any way to do that? Custom .INI resolutions for the handful of horizontal games I play? I'm not sure what you mean by "too small". 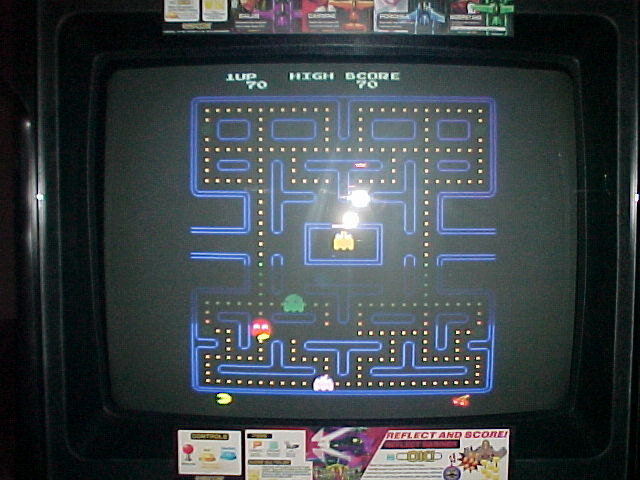 On my 25" horizontal monitor that I have adjusted to fully show pacman, horizontal games like Mortal Kombat look fine. The pictures below were taken when I was using an ArcadeVGA, but with my current setup, they look the same. 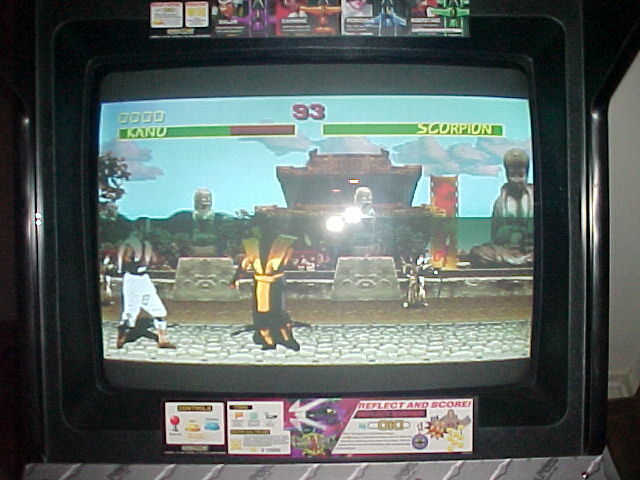 Notice that Mortal Kombat is slightly squashed vertically, but I wouldn't call it too small. Is there a specific game (or games) on your setup that look particularly bad? Maybe there's another problem. You could probably force all the vertical games to run at 640x480 or 800x600, letting MAME stretch the image to fill the screen while preserving the aspect ratio. ...but I'm not sure. Just experiment. I'm pretty sure you can get the results you want. Thanks Krick! The setting I had before is very similar to your screen shots. I only have a handful of vertical games so I would rather not have a couple of inches of shrinkage on the horizontal games. Your vertical.ini solution works perfectly and now I'm only losing 1/4th of an inch on my horizonal games. Everything looks great now! Thanks so much for yours and Calamity's help. Page created in 0.223 seconds with 50 queries.